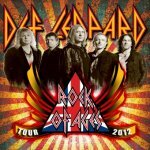 Def Leppard played a show on the Rock Of Ages tour in Newark, NJ on 11th July 2012 and a fan review was sent in by Giovanni. The show took place at the Prudential Center. "Joe Elliott is in a far better vocal shape than in last year's tour, so even the other guys may shine on (whereas sometimes in the past they were more worried about hiding the singer's missteps). Rick Allen on drums and Rick Savage on bass are really essential, but they create the solid carpet for the two six-string players, Vivian Campbell, sometimes a bit restrained, but doing so very elegantly, and Phil Collen, the real virtuoso of the English line-up, they weave chords and solos to create, together with all the majestic harmony vocals, the Def Leppard sound no tribute band can reproduce exactly."